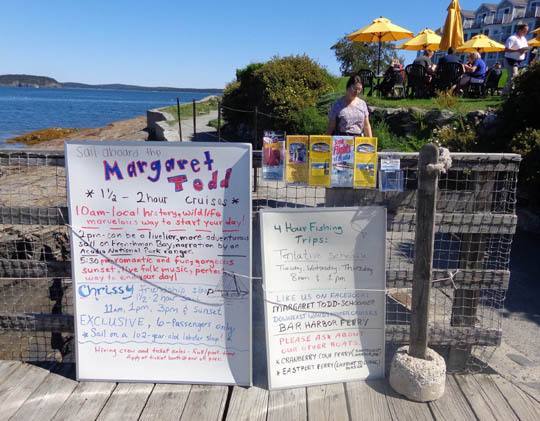 design make the Margaret Todd unique on the East coast . 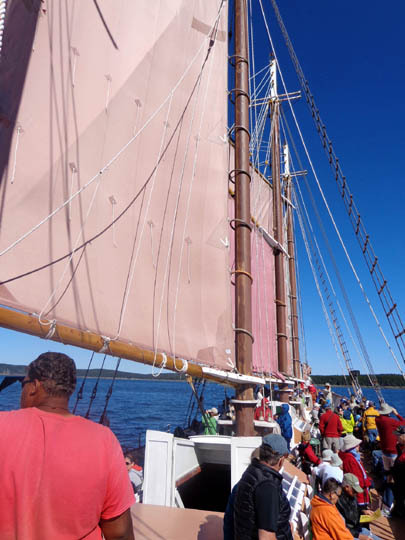 . ."
As soon as we saw this schooner docked in the water at Bar Harbor, and discovered we could make reservations to sail on her, we wanted to sign up for a windjammer cruise in Frenchman Bay. 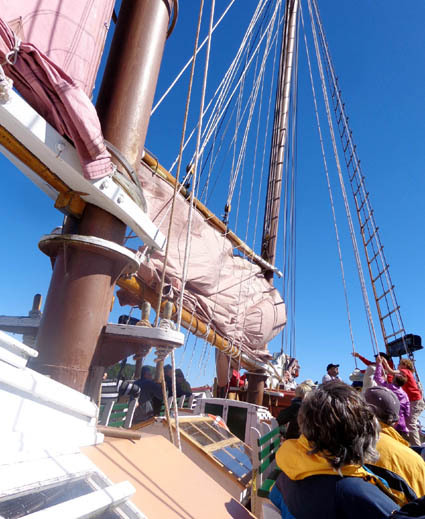 You can read more about the construction of this 151-foot long sailing vessel at the link above. 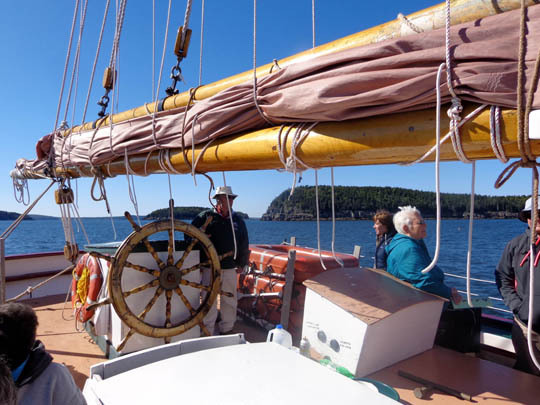 The remaining photos of the boat are ones I took from shore and while we were out on our cruise. 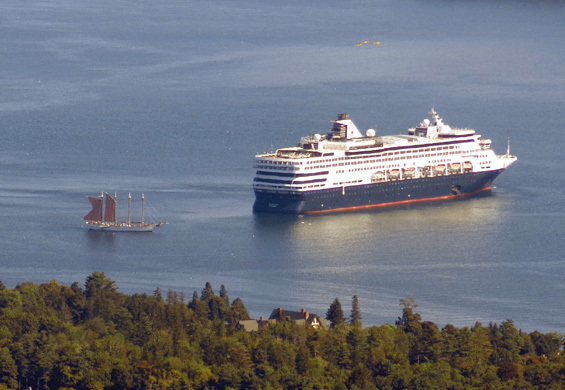 The best ways to get a photo like the one above are from a nearby boat when the Margaret Todd is sailing or with a good telephoto lens somewhere on shore or up on Cadillac Mountain. 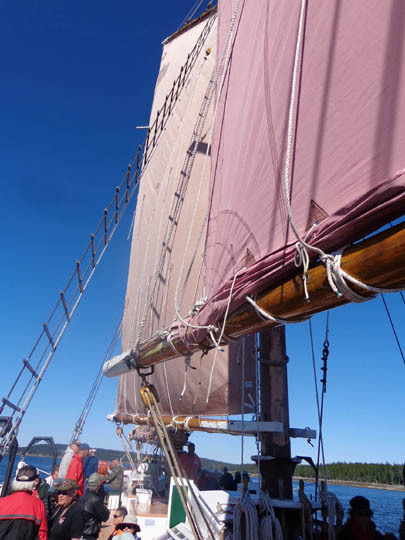 She doesn't always sail with all nine sails unfurled, just the number needed for current conditions. 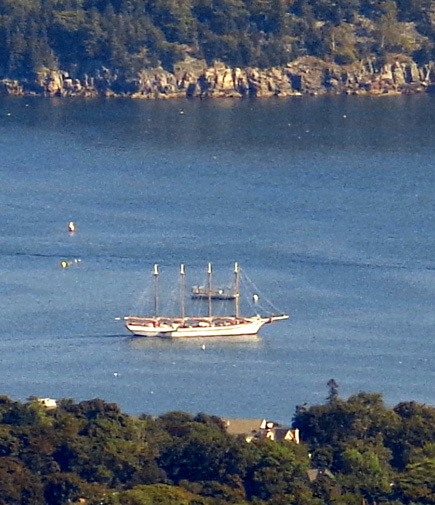 I did get several long-distance photos of the schooner from the summit of Cadillac Mountain several days before our cruise but the 16-megapixel, 16x zoom on my little compact Sony couldn't capture any real details of the vessel from way up there. 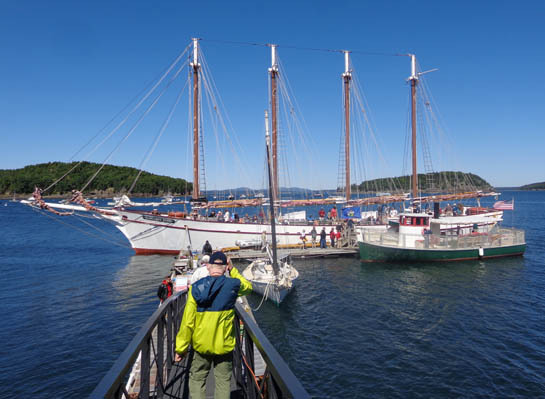 I didn't wait long enough that day to see all the sails go up. My bad. 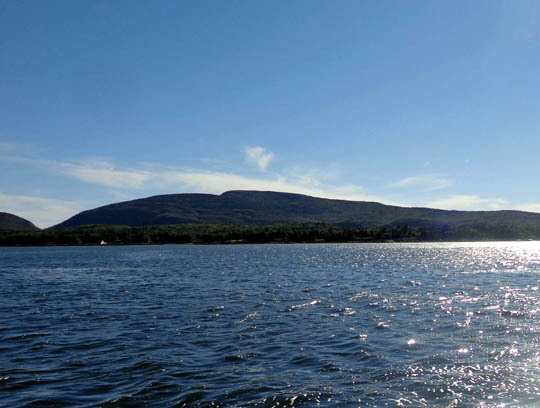 We purchased our tickets online on Friday for today's 2 PM cruise; the total cost was $70 for the two of us for a two-hour cruise. 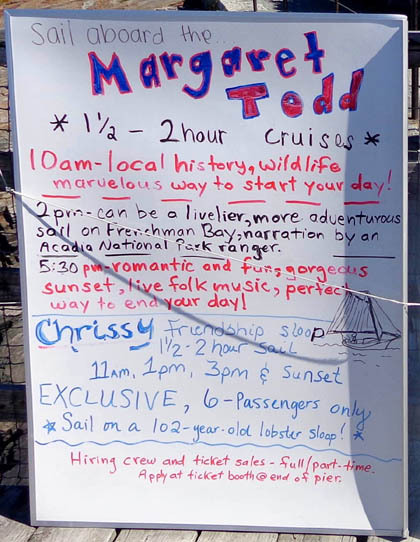 We chose this cruise because it is narrated by a national park service ranger and is advertised to be a "livelier, more adventurous sail on Frenchman Bay:"
The company offers two other types of cruises on the Margaret Todd that you can read about on the sign above. 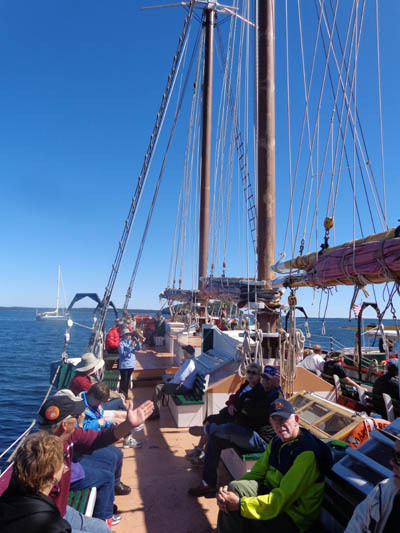 It also operates three different passenger ferries, a small, historic lobster sloop that holds six guests, and it offers half-day fishing trips. The boat wasn't totally full so we had plenty of room to sit or walk around to take photos of the scenery (islands, harbor, Cadillac and other mountains, etc. 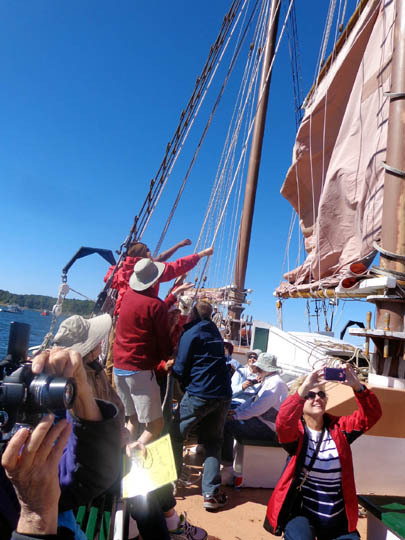 ), wildlife (sea birds and porpoises), and other things the ranger and captain pointed out to us as we sailed around the bay. 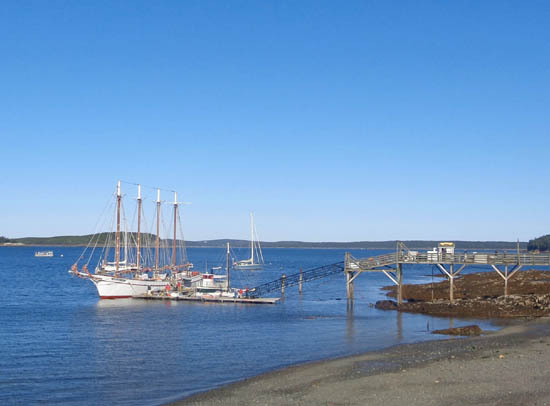 I believe the land mass to the right is Stave Island. 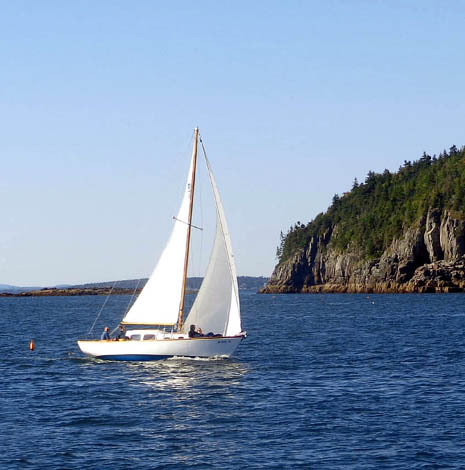 The small light green islands are part of Acadia National Park; they include Bar Island, due north of Bar Harbor. 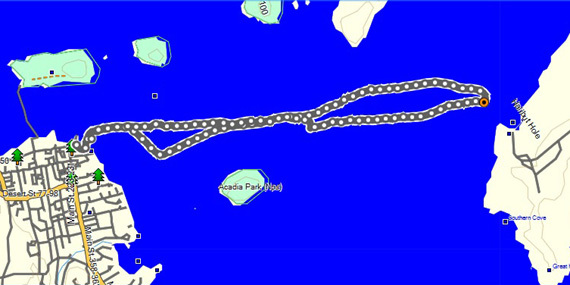 The little line in the water indicates the path people can take to walk to the island when the tide is low. That was interesting to watch. 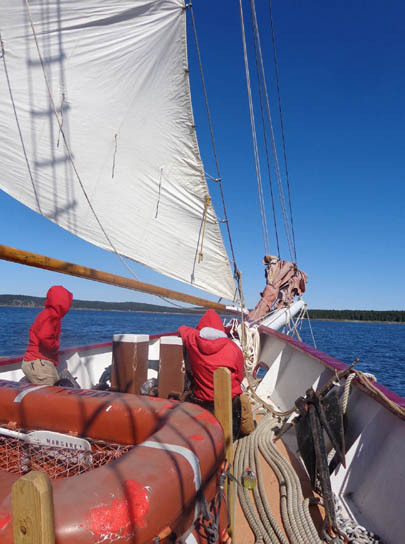 With all those sails up, the captain and crew were able to maneuver the boat without the engine for most of the two hours we sailed around in Frenchman Bay. 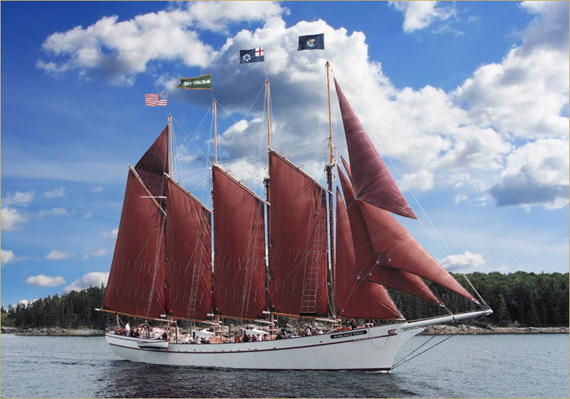 They apparently didn't need to use all nine sails. 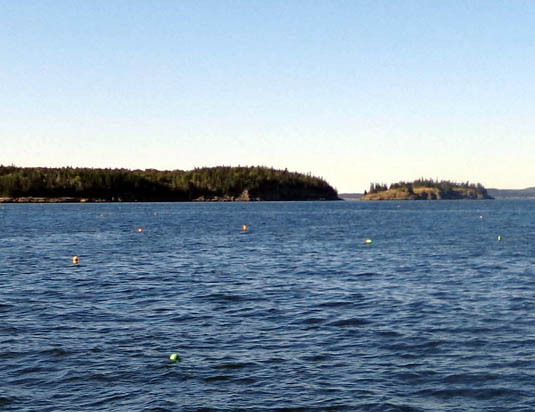 Most of the islands near Bar Harbor are now owned by the National Park Service rather than individuals so we didn't see much development except near town. 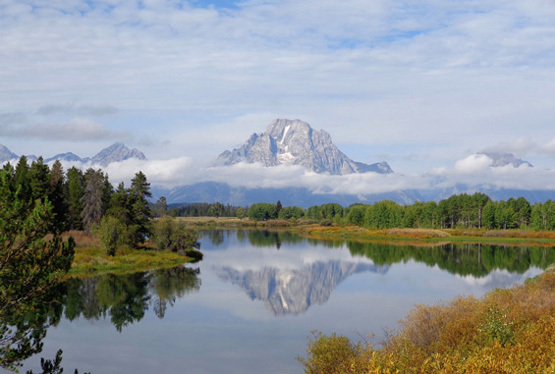 We talked with several couples from around the USA when the ranger and captain weren't doing any narration. Everyone was friendly and in a good mood. How could they not be, on such a beautiful day and in such a beautiful place?